Kenfig National Nature Reserve Nature ReserveKenfig National Nature Reserve is one of the finest wildlife habitats in Wales and is also one of the last remnants of a huge dune system that once stretched along the coastline of southern Wales from the Ogmore River to the Gower peninsular. Glamorgan's largest natural lake, Kenfig Pool, is set on the edge of this beautiful sand dune nature reserve with spectacular views across Swansea Bay to the Gower. The Reserve is home to a wide variety of rare and endangered species of plants and animals, including the Fen Orchid. The dune system makes up part of the largest active sand dune system in europe. Kenfig NNR is a favourite refuge for wildfoul all year round and is one of the few places in the UK where the bittern can be seen during the winter - the area is a very popular place with birdwatchers. The area is managed to ensure the dunes don't become overcome by dense grassland and scrub woodland which would result in the loss of much of the important and diverse wildlife. The reserve is managed so that the delicate balance of habitats is maintained and visitors can freely wander the area without harming any of the reserve and its features. Disabled access is encouraged yet access to the dune systems is difficult for wheelchair users. There is an Information Centre for children of all ages, and a shop for leaflets, books and conservation gifts. Stroll along the boardwalk and stop at one of the bird hides overlooking the 70-acre freshwater pool, a favourite refuge for wildfowl at all times of the year. Wardens are often on site to answer any queries you may have. Kenfig NNR (includes the area of sand dunes and Kenfig Pool) are designated as a Site of Special Scientific Interest (SSSI). 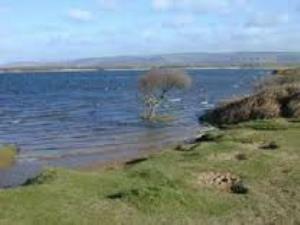 Glamorgan's largest natural lake, Kenfig Pool, is set on the edge of this beautiful sand dune nature reserve. Kenfig National Nature Reserve can be reached from Junction 37 of the M4 Motorway and is signposted from North Cornelly, Pyle and Porthcawl. Free car park. There is currently n cafe but soft drinks and chcolates,crisp, ice cream ect are available from the farm shop.